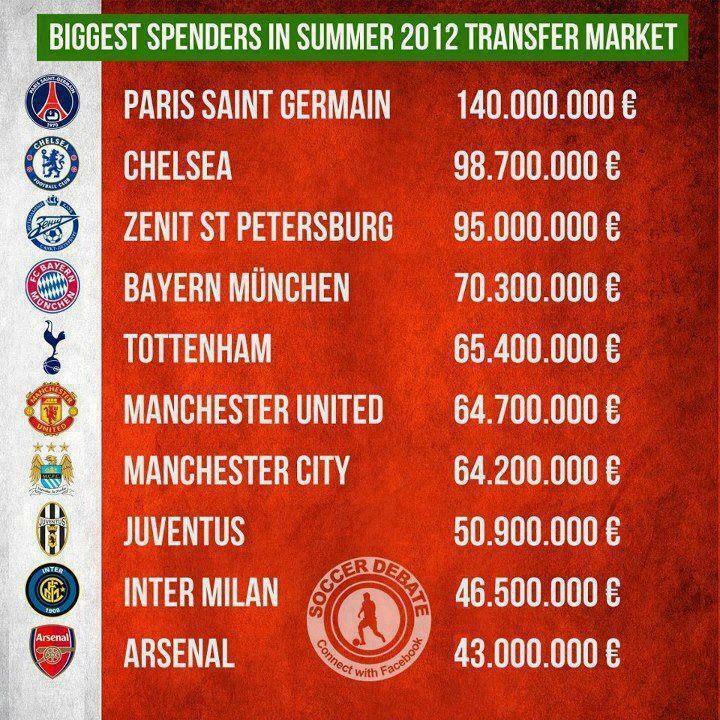 It is interesting to notice a change in spending habit of European clubs in transfer market 2012, compare to 2011. For the first time, a Ligue 1(France league) team have bypassed Russian-owned Chelsea in luring the players to their club. Paris Saint-Germain FC, officially owned by Qatar Investment Authority, had more than enough money to spend on new players, as requested by their world class Italian coach, Carlo Ancelotti. Another new face in chart of biggest spenders this season is Russia’s Zenit St Petersburg. 2-time Russian champions are now among top 3 biggest spenders among European clubs. Of course the huge investment stake by Gazprom company as one of the most lucrative energy companies in the world-based out of Russia- helps their cause. However, this list does not necessarily mean these 10 teams will be guaranteed local or European championship. For a fact that likes of Barcelona, Real Madrid,already have many stars in their squads that didnt feel the need to make more changes. It will be interesting to see how these teams fare at the end of the season, and whether these huge spending proved worthy or not. We’ll sure get back to this chart again in 9 months time!